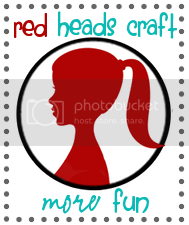 Red Heads Craft More Fun: Hello Birdie. Did you know they make yellow burlap? Amazing! When I saw it, I knew exactly what I had to do. I made a pillow. You can cut your burlap to whatever size you want. Mine was pretty small, like 6"x9"ish. I then created a stencil using my Silhouette. I stenciled it on using white and grey. I put the right sides of my pillow together and sewed around it, leaving an opening so that I could stuff it. Don't forget to clip the corners. I then stuffed my pillow with grocery bags (recycled material) and finished sewing it closed. I made it as a gift to my bestie. She and I took a chair reupholstery class and she wanted to put it on her chair. It's super cute. Look how adorable her chair turned out! I'll be linking to these parties this week. Spring is in the air!! Beautiful little pillow Courtney! I love that you stuffed it with grocery bags! Great way to use them up! I never would have thought to stuff a pillow with grocery bags! Such a great idea. The pillow looks fantastic on that chair, she did a wonderful job! That stencil is really cute! Now I'm thinking about what else I could decorate like you did this pillow. This are too cute! I love burlap! I just found you on Crafting Roulette. I would love for you to link up to Blissful and Domestic Feature Friday Linky Party.